These are the sole genuine workbooks for New JLPT compiled by the organizers of the test. Questions and correct answers of the past tests were released in the years of the old test. However, it is no longer available after the 2010 revision of the test and then the official workbooks were published instead. It includes test items taken from actual tests conducted in 2010 and 2011, and have almost the same number of test items as the actual test. The books come with audio CD and scripts of “Listening” questions. You can prepare for all the sections – vocabulary, kanji, listening comprehension, grammar and reading – of one level in one book. Thus you can practice all the sections rapidly. With these books you can also find out which section you should practice more. In the end of the book, half the number of the real test questions is included for you to check your ability just before JLPT. 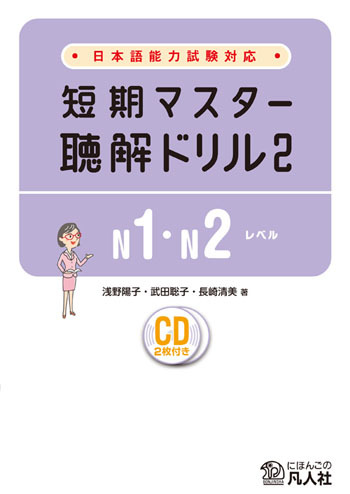 The book for JLPT Level N4 has newly appeared in the KIRARI☆NIHONGO series after N5. Similarly to the book for N5, this textbook serves you ‘dictionary’, ‘practice book’ and ‘JLPT practice test’ for vocabulary of JLPT Level N4. For every genre of words, tasks are included for you to practice using them in your own speech and writing. Thus by using this book constantly, you can improve your good command of vocaulary. You can also prepare for the JLPT Level N4 [Language Knowledge (Vocabulary)]. Various useful ideas for learning are introduced, such as to learn in groups and to learn in context. In order to leave an impression, abundant illustrations are included. The book has 4 editions of JLPT practice test. The vocabulary lists with accent marks and English translations are included at the end of the book. With this book your Japanese-language ability will twinkle ‘KIRARI☆’ like a star in the sky!